Former Monty Python member Michael Palin has won a devoted following for his travel documentaries on BBC, and he has also presented a few shows about artists, notably about the Danish artist Vilhelm Hammershoi. (Direct link to YouTube video) In this hour-long video, he takes a look at the world of the American painter Andrew Wyeth. With his characteristic humor and humility, Palin begins the story at the Olson farm in Maine where Wyeth created his enigmatic painting "Christina's World" and then travels to the locations around Chadds Ford, Pennsylvania that inspired the artist, including Kuerner's Farm and NC Wyeth's Studio. The documentary presents archival family films of NC Wyeth, and of young Andy playacting in costume. Instead of limiting his interviews to scholars and academics, Palin talks to people who knew Wyeth: the son of his model Karl Kuerner, the farmer who buried him, as well as Wyeth's niece, and his son Jamie. Wyeth's widow Betsy apparently declined to participate. 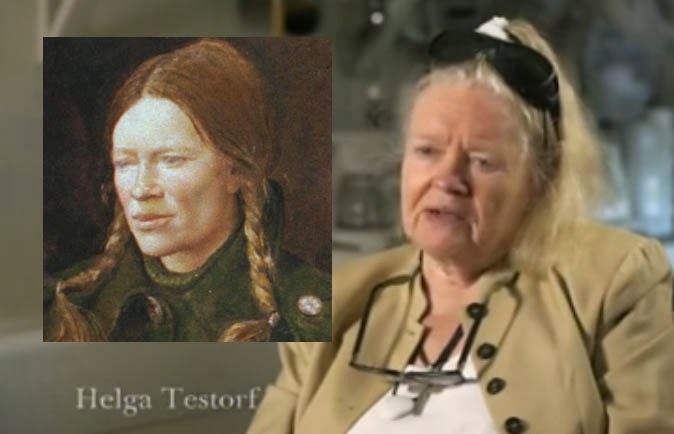 Palin conducts a sensitive interview with Helga Testorf, the model for the extensive series of figural works that Wyeth painted secretly over many years. Was Helga his mistress? Helga answers the tongue-waggers: "They didn't know any better. They did not know our language. We were not talking that way." Helga says that Wyeth wanted the work to be revealed after the artist's death, and that keeping their privacy during the ensuing scandal was a challenge. The video was nicely produced, but I found the use of selective "artistic" blurring to be distracting and annoying—and unsuited to Wyeth, whose art was more about sharp focus, selective cropping, and limited color. I just spent a lovely morning hour watching the Wyeth video. Thank you , James. Great! I will watch that later tonight. Wyeth is one of my top 3 favorite artists. I have found that blurring, or depth of focus changes have plagued art videos lately.A standard 5 minute video will contain 4:30 worth of closeups with change of depth of focus between paint and brushes, studio window and leaves. Pretty much anything but the artwork. I stumbled across this video a week or so ago - fascinating! No idea Christina couldn't walk - or that he did several other paintings of her. Also great to see Helga. I saw the painting of her in Detroit back in the late 80's I think. Stunning! Loved this peek into Andrew's world. A good documentary turns legends into ordinary people. I didn't know about this. Wow, am I glad you shared it! Thank you very much for posting this. NC and Andrew Wyeth were such wonderful painters and very important influences in my life. The Wyeth family is now Legendary, sooner or later to become Mythical. Makers of documentary films might be less sensitive to the work if they aren't artists themselves. There was a fair amount of respect in the film, in the sense of "tell us a little but not too much," and more of a sweet attitude that ignored the darkness that also existed in the Wyeth family. As another lifelong fan of the whole family, it seems depressing to me to think there's a Gift shop in Christina and Alvaro's former home. How exciting to hear about this video, thank you James. It is so sad that Andrew Wyeth’s "Helga Paintings" were not bought by a museum in his own country. The Helga paintings were bought by someone in Japan for $2,000,000 which was a reasonable cost considering the paintings took 10 years of work by this renowned master painter. When are our museums going to recognize that excellent realistic art has great value? Most people would rather see art such as the Helga Paintings than abstract art and poorly executed art. The removal of this collection from the USA was a great loss to our people. Is there something we artists and art lovers can do now to change this trend? Years ago I saw a collection of Andrew Wyeth drawings at one of the art museums in Tulsa (I don't remember if it was the Gilcrease or the other one, whatever it is called). They had a lot of work (including sketches for Christina's World) but no finished paintings. Reason? Wyeth worked in tempera, which is very susceptible to environmental changes. I remember reading once that he preferred tempera because he felt his tendency was to overwork paintings when using oils. He used the linearity of temera to help discipline the planning of his works. In light of this, visual manipulation of the work is highly ironic. My family is from Tenant's Harbor, ME so we think of the Wyeths as locals :) I believe there is one painting Andrew did of a relative looking out the window of his house. You can even find Wiley's Corner on your way to the Harbor...if you're very observant!